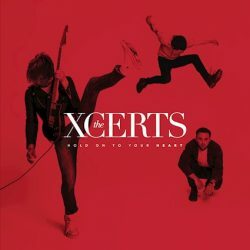 Scottish alt rock act The Xcerts release their fourth album Hold On To Your Heart on 19th January via Raygun Records. This is the album that will catapult the band into the rock mainstream, each of the ten tracks act as individual masterclasses in pop rock. Infectious and insatiable, this is an album that you’ll have on repeat and fall in love with right from your first listen. We could go into detail and praise every track on the album but that’d be boring. You’ll already know how immediate and infectious the singles are (stream them below) and the rest of album follows suit with the sax of ‘Drive Me Wild’ and ‘We Are Gonna Live’ being highlights alongside the fragile and emotional ‘Show Me Beautiful’ and powerful ‘First Kiss’. We’ll leave you with some trivia, each band member features on the front of the artwork for each album they have released. Drummer, Tom Heron is on the cover of 2009’s In The Cold Wind We Smile, Scatterbrain features bassist Jordan Smith on the cover and Murray Macleod appears on There Is Only You, so it’s no surprise they’re all on the front of this one.